The measurement of insulation resistance is a common routine test performed on all types of electrical wires and cables. As a production test, this test is often used as a customer acceptance test, with minimum insulation resistance per unit length often specified by the customer. The results obtained from IR Test are not intended to be useful in finding localized defects in the insulation as in a true HIPOT test, but rather give information on the quality of the bulk material used as the insulation. Even when not required by the end customer, many wire and cable manufacturers use the insulation resistance test to track their insulation manufacturing processes, and spot developing problems before process variables drift outside of allowed limits. Insulation testers with test voltage of 500, 1000, 2500 and 5000 V are available. When AC Voltage is used, The Rule of Thumb is Test Voltage (A.C) = (2X Name Plate Voltage) +1000. When DC Voltage is used (Most used in All Megger), Test Voltage (D.C) = (2X Name Plate Voltage). Make sure that all connections in the test circuit are tight. 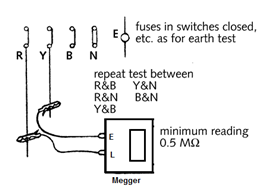 Test the megger before use, whether it gives INFINITY value when not connected, and ZERO when the two terminals are connected together and the handle is rotated. Make sure when testing for earth, that the far end of the conductor is not touching, otherwise the test will show faulty insulation when such is not actually the case. Spare conductors should not be meggered when other working conductors of the same cable are connected to the respective circuits. Ensure that all conductors have been reconnected properly. Test the functions of Points, Tracks & Signals connected through the cable for their correct response. In case of signals, aspect should be verified personally. In case of points, verify positions at site. Check whether any polarity of any feed taken through the cable has got earthed inadvertently. All equipment under test MUST be disconnected and isolated. Equipment should be discharged (shunted or shorted out) for at least as long as the test voltage was applied in order to be absolutely safe for the person conducting the test. Never use Megger in an explosive atmosphere. Make sure all switches are blocked out and cable ends marked properly for safety. Cable ends to be isolated shall be disconnected from the supply and protected from contact to supply, or ground, or accidental contact. Erection of safety barriers with warning signs, and an open communication channel between testing personnel. Do not megger when humidity is more than 70 %. Good Insulation: Megger reading increases first then remain constant. Bad Insulation: Megger reading increases first and then decreases. Expected IR value gets on Temp. 20 to 30 decree centigrade. If above temperature reduces by 10 degree centigrade, IR values will increased by two times. If above temperature increased by 70 degree centigrade IR values decreases by 700 times. 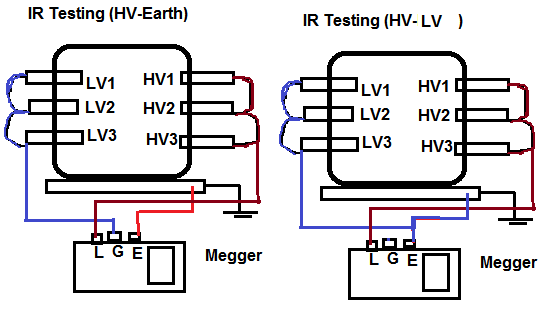 Meggers is equipped with three connection Line Terminal (L), Earth Terminal (E) and Guard Terminal (G). Resistance is measured between the Line and Earth terminals, where current will travel through coil 1. The “Guard” terminal is provided for special testing situations where one resistance must be isolated from another. Let’s us check one situation where the insulation resistance is to be tested in a two-wire cable. To measure insulation resistance from a conductor to the outside of the cable, we need to connect the “Line” lead of the megger to one of the conductors and connect the “Earth” lead of the megger to a wire wrapped around the sheath of the cable. 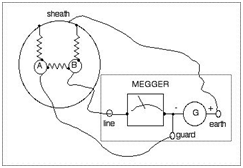 In this configuration the Megger should read the resistance between one conductor and the outside sheath. We want to measure Resistance between Conductor- 2To Sheaths but Actually Megger measure resistance in parallel with the series combination of conductor-to-conductor resistance (Rc1-c2) and the first conductor to the sheath (Rc1-s). If we don’t care about this fact, we can proceed with the test as configured. If we desire to measure only the resistance between the second conductor and the sheath (Rc2-s), then we need to use the megger’s “Guard” terminal. Connecting the “Guard” terminal to the first conductor places the two conductors at almost equal potential. With little or no voltage between them, the insulation resistance is nearly infinite, and thus there will be no current between the two conductors. Consequently, the Megger’s resistance indication will be based exclusively on the current through the second conductor’s insulation, through the cable sheath, and to the wire wrapped around, not the current leaking through the first conductor’s insulation. The guard terminal (if fitted) acts as a shunt to remove the connected element from the measurement. In other words, it allows you to be selective in evaluating certain specific components in a large piece of electrical equipment. For example consider a two core cable with a sheath. As the diagram below shows there are three resistances to be considered. If we measure between core B and sheath without a connection to the guard terminal some current will pass from B to A and from A to the sheath. Our measurement would be low. By connecting the guard terminal to A the two cable cores will be at very nearly the same potential and thus the shunting effect is eliminated. Windings are never left floating for insulation resistance measurements. Solidly grounded winding must have the ground removed in order to measure the insulation resistance of the winding grounded. If the ground cannot be removed, as in the case of some windings with solidly grounded neutrals, the insulation resistance of the winding cannot be measured. Treat it as part of the grounded section of the circuit. 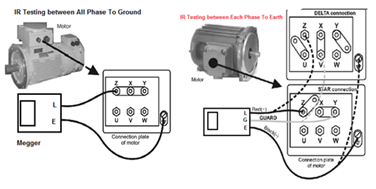 For electric motor, we used a insulation tester to measure the resistance of motor winding with earthing ( E ). R =IR Value in MΩs per 1000 feet (305 meters) of cable. 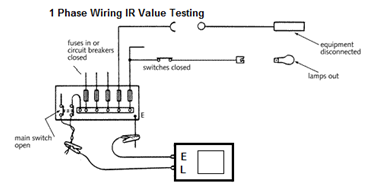 The IR test between Phase-Natural to earth must be carried out on the complete installation with the main switch off, with phase and neutral connected together, with lamps and other equipment disconnected, but with fuses in, circuit breakers closed and all circuit switches closed. Min IR Value = 50 MΩ / No of Electrical outlet. (All Electrical Points with fitting & Plugs). Most induction motors are started directly on line, but when very large motors are started that way, they cause a disturbance of voltage on the supply lines due to large starting current surges. To limit the starting current surge, large induction motors are started at reduced voltage and then have full supply voltage reconnected when they run up to near rotated speed. Two methods are used for reduction of starting voltage are star delta starting and auto transformer stating. There are two contactors that are close during run, often referred to as the main contractor and the delta contactor. These are AC3 rated at 58% of the current rating of the motor. The third contactor is the star contactor and that only carries star current while the motor is connected in star. The current in star is one third of the current in delta, so this contactor can be AC3 rated at one third (33%) of the motor rating. 1) Contactors (Main, star and delta contactors) 3 No’s (For Open State Starter) or 4 No’s (Close Transient Starter). 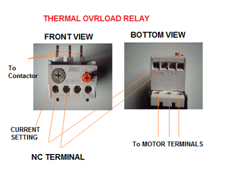 2) Time relay (pull-in delayed) 1 No. 3) Three-pole thermal over current release 1No. 4) Fuse elements or automatic cut-outs for the main circuit 3 Nos. 5) Fuse element or automatic cut-out for the control circuit 1No. The main circuit breaker serves as the main power supply switch that supplies electricity to the power circuit. The main contactor connects the reference source voltage R, Y, B to the primary terminal of the motor U1, V1, W1. The star contactor serves to initially short the secondary terminal of the motor U2, V2, W2 for the start sequence during the initial run of the motor from standstill. This provides one third of DOL current to the motor, thus reducing the high inrush current inherent with large capacity motors at startup. Controlling the interchanging star connection and delta connection of an AC induction motor is achieved by means of a star delta or wye delta control circuit. The control circuit consists of push button switches, auxiliary contacts and a timer. Discuss mention above is called open transition switching because there is an open state between the star state and the delta state. In open transition the power is disconnected from the motor while the winding are reconfigured via external switching. When a motor is driven by the supply, either at full speed or at part speed, there is a rotating magnetic field in the stator. This field is rotating at line frequency. The flux from the stator field induces a current in the rotor and this in turn results in a rotor magnetic field. When the motor is disconnected from the supply (open transition) there is a spinning rotor within the stator and the rotor has a magnetic field. Due to the low impedance of the rotor circuit, the time constant is quite long and the action of the spinning rotor field within the stator is that of a generator which generates voltage at a frequency determined by the speed of the rotor. 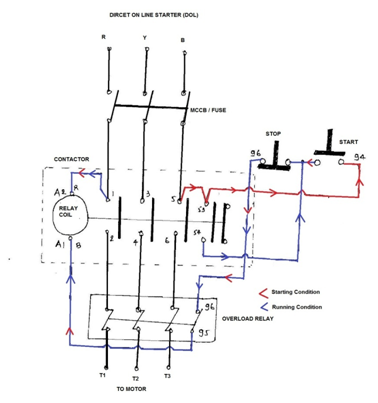 When the motor is reconnected to the supply, it is reclosing onto an unsynchronized generator and this result in a very high current and torque transient. The magnitude of the transient is dependent on the phase relationship between the generated voltage and the line voltage at the point of closure can be much higher than DOL current and torque and can result in electrical and mechanical damage. Open transition starting is the easiest to implement in terms or cost and circuitry and if the timing of the changeover is good, this method can work well. In practice though it is difficult to set the necessary timing to operate correctly and disconnection/reconnection of the supply can cause significant voltage/current transients. OFF State: All Contactors are open. Star State: The Main [KM3] and the Star [KM1] contactors are closed and the delta [KM2] contactor is open. The motor is connected in star and will produce one third of DOL torque at one third of DOL current. Open State: This type of operation is called open transition switching because there is an open state between the star state and the delta state. The Main contractor is closed and the Delta and Star contactors are open. There is voltage on one end of the motor windings, but the other end is open so no current can flow. The motor has a spinning rotor and behaves like a generator. (2) Closed Transition Star/Delta Starter. There is a technique to reduce the magnitude of the switching transients. 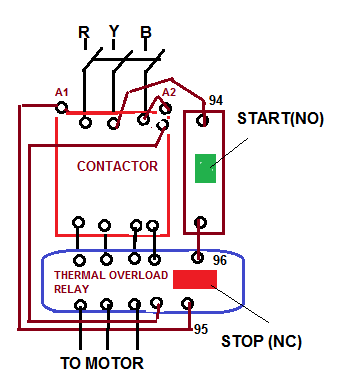 This requires the use of a fourth contactor and a set of three resistors. The resistors must be sized such that considerable current is able to flow in the motor windings while they are in circuit. The auxiliary contactor and resistors are connected across the delta contactor. In operation, just before the star contactor opens, the auxiliary contactor closes resulting in current flow via the resistors into the star connection. Once the star contactor opens, current is able to flow round through the motor windings to the supply via the resistors. These resistors are then shorted by the delta contactor. If the resistance of the resistors is too high, they will not swamp the voltage generated by the motor and will serve no purpose. Star State. The Main [KM3] and the Star [KM1] contactors are closed and the delta [KM2] contactor is open. The motor is connected in star and will produce one third of DOL torque at one third of DOL current. Star Transition State. The motor is connected in star and the resistors are connected across the delta contactor via the aux [KM4] contactor. Closed Transition State. The Main [KM3] contactor is closed and the Delta [KM2] and Star [KM1] contactors are open. Current flows through the motor windings and the transition resistors via KM4. Delta State. The Main and the Delta contactors are closed. The transition resistors are shorted out. The Star contactor is open. The motor is connected to full line voltage and full power and torque are available. 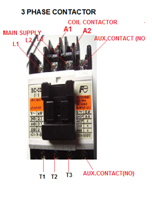 It is Important the pause between star contactor switch off and Delta contactor switch is on correct. This is because Star contactor must be reliably disconnected before Delta contactor is activated. It is also important that the switch over pause is not too long. For 415v Star Connection voltage is effectively reduced to 58% or 240v. The equivalent of 33% that is obtained with Direct Online (DOL) starting. If Star connection has sufficient torque to run up to 75% or %80 of full load speed, then the motor can be connected in Delta mode. When connected to Delta configuration the phase voltage increases by a ratio of V3 or 173%. The phase currents increase by the same ratio. The line current increases three times its value in star connection. During transition period of switchover the motor must be free running with little deceleration. While this is happening “Coasting” it may generate a voltage of its own, and on connection to the supply this voltage can randomly add to or subtract from the applied line voltage. This is known as transient current. Only lasting a few milliseconds it causes voltage surges and spikes. Known as a changeover transient. For a star-delta starter there is a possibility to place the overload protection in two positions, in the line or in the windings. In the line is the same as just putting the overload before the motor as with a DOL starter. The rating of Overload (In Line) = FLC of Motor. Disadvantage: If the overload is set to FLC, then it is not protecting the motor while it is in delta (setting is x1.732 too high). In the windings means that the overload is placed after the point where the wiring to the contactors are split into main and delta. The overload then always measures the current inside the windings. The setting of Overload Relay (In Winding) =0.58 X FLC (line current). Disadvantage: We must use separate short circuit and overload protections. There are two contactors that are close during run, often referred to as the main contractor and the delta contactor. These are AC3 rated at 58% of the current rating of the motor. The third contactor is the star contactor and that only carries star current while the motor is connected in star. The current in star is 1/ √3= (58%) of the current in delta, so this contactor can be AC3 rated at one third (33%) of the motor rating. Low Starting Torque (Torque = (Square of Voltage) is also reduce). Six Terminal Motor Required (Delta Connected). It requires 2 set of cables from starter to motor. It provides only 33% starting torque and if the load connected to the subject motor requires higher starting torque at the time of starting than very heavy transients and stresses are produced while changing from star to delta connections, and because of these transients and stresses many electrical and mechanical break-down occurs. In this method of starting initially motor is connected in star and then after change over the motor is connected in delta. The delta of motor is formed in starter and not on motor terminals. High transmission and current peaks: When starting up pumps and fans for example, the load torque is low at the beginning of the start and increases with the square of the speed. When reaching approx. 80-85 % of the motor rated speed the load torque is equal to the motor torque and the acceleration ceases. To reach the rated speed, a switch over to delta position is necessary, and this will very often result in high transmission and current peaks. In some cases the current peak can reach a value that is even bigger than for a D.O.L start. Applications with a load torque higher than 50 % of the motor rated torque will not be able to start using the start-delta starter. 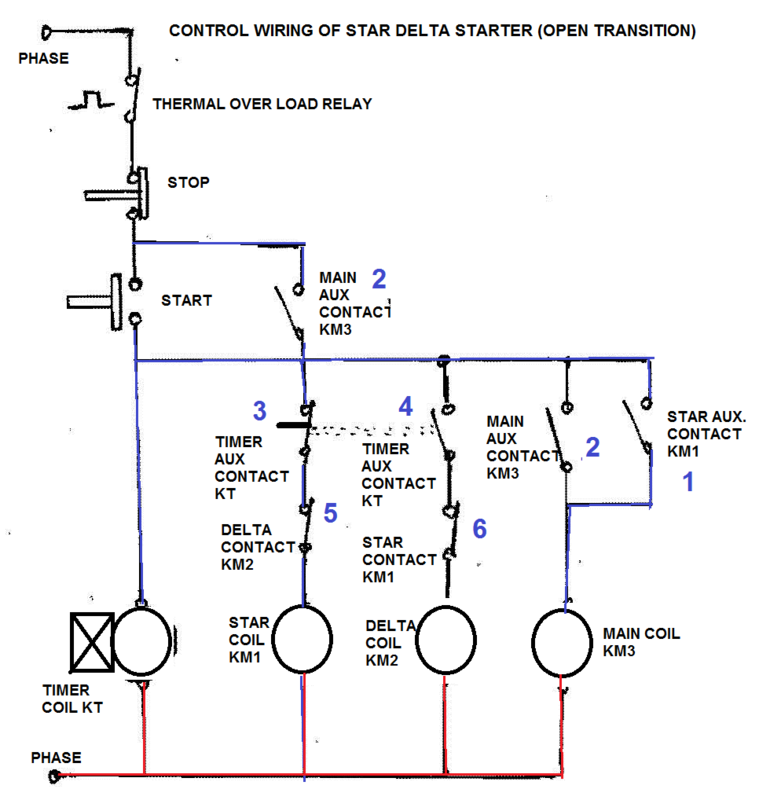 Low Starting Torque: The star-delta (wye-delta) starting method controls whether the lead connections from the motor are configured in a star or delta electrical connection. The initial connection should be in the star pattern that results in a reduction of the line voltage by a factor of 1/√3 (57.7%) to the motor and the current is reduced to 1/3 of the current at full voltage, but the starting torque is also reduced 1/3 to 1/5 of the DOL starting torque . The transition from star to delta transition usually occurs once nominal speed is reached, but is sometimes performed as low as 50% of nominal speed which make transient Sparks.